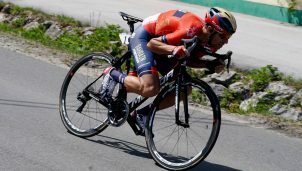 El joven alemán Max Walschied se ha llevado la tercera etapa del Tour de Yorkshire al sprint, siendo el más rápido al sprint por delante del danés Magnus Cort Nielsen. Por su parte, Jon Aberasturi se ha vuelto a quedar cerca y ha logrado una tercera plaza en meta, midiéndose frente a varios grandes nombres de la velocidad. 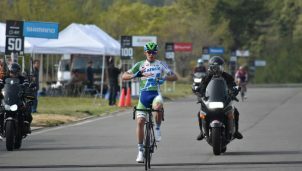 Eso sí, el velocista de Astana ha conseguido bonificar con su segunda posición y ahora aumenta su distancia como líder a 10 segundos sobre Greg Van Avermaet. Mientras tanto, Edu Prades sigue tercero. Y ya sólo falta una etapa para defender esa plaza de podio o, si se tercia, buscar un escalón más alto. 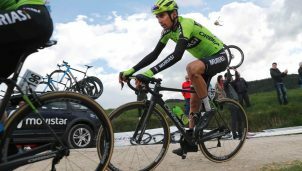 La última jornada del Tour de Yorkshire, donde Euskadi-Murias está firmando una carrera de enorme mérito, va desde Halifax a Leeds sobre un recorrido de 189 kilómetros nuevamente plagado de cotas. Por tanto, el trazado vuelve a venirle bien al catalán. 2 CORT NIELSEN Magnus Astana Pro Team m.t. 3 ABERASTURI Jon Euskadi – Murias m.t. 4 COQUARD Bryan Vital Concept Cycling Club m.t. 5 MCCARTHY Robert-jon JLT Condor m.t. 6 SWIFT Connor Madison Genesis m.t. 7 TEUNISSEN Mike Team Sunweb m.t. 8 VAN AVERMAET Greg BMC Racing Team m.t. 9 LIEPINS Emils One Pro Cycling m.t. 10 JOYCE Colin Rally Cycling m.t. 11 PRADES Eduard Euskadi – Murias m.t. 12 BIERMANS Jenthe Team Katusha – Alpecin m.t. 13 BLYTHE Adam Aqua Blue Sport m.t. 14 GODON Dorian Cofidis, Solutions Crédits m.t. 15 VAN EMPEL Etienne Roompot – Nederlandse Loterij m.t. 16 BAGÜES Aritz Euskadi – Murias m.t. 17 CULLAIGH Gabriel Great Britain m.t. 18 HOLLENSTEIN Reto Team Katusha – Alpecin m.t. 19 KIŠERLOVSKI Robert Team Katusha – Alpecin m.t. 20 DOMAGALSKI Karol One Pro Cycling m.t. 21 SLATER Alistair JLT Condor m.t. 22 LOWSLEY WILLIAMS James Canyon Eisberg m.t. 23 CRAS Steff Team Katusha – Alpecin m.t. 24 BOOKWALTER Brent BMC Racing Team m.t. 25 BEVIN Patrick BMC Racing Team m.t. 26 HALVORSEN Kristoffer Team Sky m.t. 27 BRADBURY Edmund JLT Condor m.t. 28 WRIGHT Alfred Great Britain m.t. 29 SHAW James Great Britain m.t. 30 BARTHE Cyril Euskadi – Murias m.t. 31 BUDDING Martijn Roompot – Nederlandse Loterij m.t. 32 PIDCOCK Thomas Great Britain m.t. 33 WOOD Oliver JLT Condor m.t. 34 BIBBY Ian JLT Condor m.t. 35 SWIFT Ben Great Britain m.t. 36 CHRISTIAN Mark Aqua Blue Sport m.t. 37 HIVERT Jonathan Direct Energie m.t. 38 VAN GENECHTEN Jonas Vital Concept Cycling Club m.t. 39 DUNBAR Edward Aqua Blue Sport m.t. 40 MATÉ Luis Ángel Cofidis, Solutions Crédits m.t. 41 PEARSON Daniel Aqua Blue Sport m.t. 42 WYSS Danilo BMC Racing Team m.t. 43 PAUWELS Serge Dimension Data m.t. 44 PEREZ Anthony Cofidis, Solutions Crédits m.t. 45 MCCORMICK Hayden One Pro Cycling m.t. 46 BONNAFOND Guillaume Cofidis, Solutions Crédits m.t. 47 GULLEN James JLT Condor m.t. 48 VAN DER LIJKE Nick Roompot – Nederlandse Loterij m.t. 49 MACHADO Tiago Team Katusha – Alpecin m.t. 50 HINDLEY Jai Team Sunweb m.t. 52 WILLIAMS Peter One Pro Cycling m.t. 53 BASSO Leonardo Team Sky m.t. 54 STORER Michael Team Sunweb m.t. 55 VAN BAARLE Dylan Team Sky m.t. 56 ROSSETTO Stephane Cofidis, Solutions Crédits m.t. 57 WALKER Joey Great Britain m.t. 58 MURPHY Kyle Rally Cycling m.t. 59 ANDERSON Ryan Rally Cycling m.t. 60 DIBBEN Jonathan Team Sky m.t. 61 BRAVO Garikoitz Euskadi – Murias m.t. 62 CORNU Jeremy Direct Energie m.t. 63 HANDLEY Richard Madison Genesis m.t. 64 LAVERACK Edward JLT Condor m.t. 65 ORAM James One Pro Cycling m.t. 66 SCOTT Jacob One Pro Cycling m.t. 67 DE GREEF Robbert Roompot – Nederlandse Loterij m.t. 68 TANFIELD Harry Canyon Eisberg m.t. 69 DOULL Owain Team Sky m.t. 70 WEENING Pieter Roompot – Nederlandse Loterij m.t. 71 CUMING Michael Madison Genesis m.t. 82 WATSON Calvin Aqua Blue Sport m.t. 83 LE TURNIER Mathias Cofidis, Solutions Crédits m.t. 84 HUNT Joshua Vitus Pro Cycling m.t. 85 HORTON Tobyn Madison Genesis m.t. 86 QUEMENEUR Perrig Direct Energie m.t. 88 MATHIS Marco Team Katusha – Alpecin m.t. 90 JOURNIAUX Axel Direct Energie m.t. 92 KENWAY Adam Vitus Pro Cycling m.t. 93 MCEVOY Jonathan Madison Genesis m.t. 95 STAMSNIJDER Tom Team Sunweb m.t. 96 MORICE Julien Vital Concept Cycling Club m.t. 97 LAMMERTINK Steven Vital Concept Cycling Club m.t. 98 CHETOUT Loïc Cofidis, Solutions Crédits m.t. 99 COURTEILLE Arnaud Vital Concept Cycling Club m.t. 103 LIGTHART Pim Roompot – Nederlandse Loterij m.t. 104 ANTHONY Jesse Rally Cycling m.t. 105 WIPPERT Wouter Roompot – Nederlandse Loterij m.t. 106 WARBASSE Larry Aqua Blue Sport m.t. 107 RENSHAW Mark Dimension Data m.t. 108 MAZZONE Leon Holdsworth Pro Racing m.t. 109 MCKENNA Sean Holdsworth Pro Racing m.t. 110 AMORES Julio Alberto Vitus Pro Cycling m.t. 111 DAVIES Liam Vitus Pro Cycling m.t. 112 VERMOTE Julien Dimension Data m.t. 113 GARDIAS Dexter Canyon Eisberg m.t. 114 DAL-CIN Matteo Rally Cycling m.t. 115 CAVENDISH Mark Dimension Data m.t. 116 DOWNING Russell Holdsworth Pro Racing m.t. 117 DAVIES Scott Dimension Data m.t. 118 TENNANT Andrew Canyon Eisberg m.t. 119 ARISTI Mikel Euskadi – Murias m.t. 120 IRIZAR Julen Euskadi – Murias m.t. 121 MINALI Riccardo Astana Pro Team m.t. 122 LIZDE Seid Holdsworth Pro Racing m.t. 123 STEDMAN Maximilian Canyon Eisberg m.t. 124 BAUHAUS Phil Team Sunweb m.t. 125 PYM George Madison Genesis m.t. 5 KIŠERLOVSKI Robert Team Katusha – Alpecin m.t. 7 CRAS Steff Team Katusha – Alpecin m.t. 9 BIBBY Ian JLT Condor m.t. 12 CHRISTIAN Mark Aqua Blue Sport m.t. 13 PEARSON Daniel Aqua Blue Sport m.t. 14 VAN EMPEL Etienne Roompot – Nederlandse Loterij m.t. 15 BIBBY Ian JLT Condor m.t. 19 HIVERT Jonathan Direct Energie m.t. 20 ORAM James One Pro Cycling m.t. 24 DOMAGALSKI Karol One Pro Cycling m.t. 25 TEUNISSEN Mike Team Sunweb m.t. 26 PIDCOCK Thomas Great Britain m.t. 27 BASSO Leonardo Team Sky m.t. 28 MURPHY Kyle Rally Cycling m.t. 31 VAN DER LIJKE Nick Roompot – Nederlandse Loterij m.t. 32 WILLIAMS Peter One Pro Cycling m.t. 33 HANDLEY Richard Madison Genesis m.t. 34 LAVERACK Edward JLT Condor m.t. 36 DOULL Owain Team Sky m.t. 38 CORNU Jeremy Direct Energie m.t. 53 ANDERSON Ryan Rally Cycling m.t. 54 WALKER Joey Great Britain m.t. 56 CULLAIGH Gabriel Great Britain m.t. 61 WYSS Danilo BMC Racing Team m.t. 78 BLYTHE Adam Aqua Blue Sport m.t. 79 VAN GENECHTEN Jonas Vital Concept Cycling Club m.t. 80 HALVORSEN Kristoffer Team Sky m.t. 81 ROSSETTO Stephane Cofidis, Solutions Crédits m.t. 90 WATSON Calvin Aqua Blue Sport m.t. 91 QUEMENEUR Perrig Direct Energie m.t. 98 DE VREESE Laurens Astana Pro Team m.t. 103 DOWNING Russell Holdsworth Pro Racing m.t. 104 TENNANT Andrew Canyon Eisberg m.t. 105 MAZZONE Leon Holdsworth Pro Racing m.t. 106 GARDIAS Dexter Canyon Eisberg m.t. 107 LIGTHART Pim Roompot – Nederlandse Loterij m.t. 108 VERMOTE Julien Dimension Data m.t. 109 CAVENDISH Mark Dimension Data m.t. 110 THOMSON Jay Robert Dimension Data m.t. 111 RENSHAW Mark Dimension Data m.t. 112 ARISTI Mikel Euskadi – Murias m.t. 116 GULLEN James JLT Condor m.t. 121 ANTHONY Jesse Rally Cycling m.t. 123 AMORES Julio Alberto Vitus Pro Cycling m.t.